Surgery to treat severe snoring is often a treatment for obstructive sleep apnea. This sleep disorder, aka sleep disordered breathing, causes serious brain-oxygen interruptions. Brain needs oxygen to function properly, period. In serious cases of sleep apnea snoring can be an indication of breathing “events,” or apneas—those pauses in breathing that, when left untreated, can lead to serious medical problems including congestive heart failure. Indications of surgical procedures include obesity, snoring unrelieved with position change, unrelieved with behavioral or lifestyle change, obstructive anatomic airway features, and sleep apnea. Not all surgical procedures are ideal for sleep apnea patients. Your physician should advise you on the need to pursue surgical interventions. The surgical procedures used most commonly to relieve snoring and the dangerous effects of sleep apnea affect the soft palate. This is the area located in the upper back of the mouth cavity and could include the uvula and the area of the tonsils. For chronic snorers and sleep apnea sufferers, the airway can often be narrow due to excess soft palate tissue and enlarged tonsils. Somnoplasty is one of the newest surgical procedures. Usually an outpatient surgery, during somnoplasty doctors remove part of the soft palate—the soft tissue along the upper back of the mouth cavity—using a non-invasive laser procedure. This usually effectively enlarges the opening of the airway and relieves snoring. Uvulopalatoplasty is also a newer procedure. During uvulopalatoplasty doctors remove the uvula, the soft dangling tissue at the back of your mouth, which can obstruct the airway during sleep leading to disruptive snoring. This procedure is a non-invasive laser surgery conducted no an outpatient basis and not recommended as a cure or proper treatment for patients with sleep apnea. Uvulopalatopharyngoplasty is an in-patient anesthesia surgery. The doctor removes part of the soft palate and reforms it for ultra-breathability. 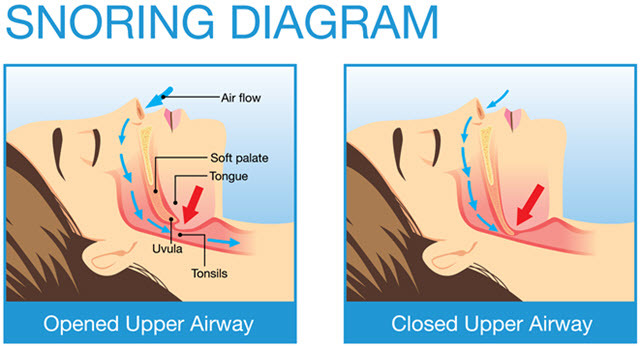 Again, this surgical procedure enhances the airway opening so you can get relief from snoring and severe sleep apnea.